This department is providing technical service to the farmer and public of this region on problematic soils, irrigation water and fertilizer use. Staff members of this department are regularly attending farmers rallies organized by REC., A.C., Kolhapur, Agril. 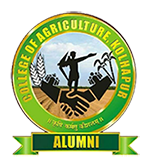 Department, sugar factories, RAWE programme Extension wing of this college, NSS activity of this college and delivered the lectures on various aspects viz. soil fertility, fertilizers, plant nutrition, organic farming, banana cultivation and quality of irrigation water etc. Staff members of this department are also involved in mobile extension service arranged by Regional Extension Centre in the Kolhapur region. The soil and plant samples were collected and on the spot analysis carried out and the necessary advice is given to the farmer for immediate recovery. Staff members of this department are also actively participating in AIR Kolhapur and Sangli by delivering the radio talks on different aspects of Soil Science and Agril. Chemistry. The faculties are being conducting training programme on INM and Soil and Water testing, fertilizer use to trainees of Ramethi. This section has utilized Rs. 11.40 lakhs grants during the year 2009 – 10. The instrument Viz. AAS, Pressure plate apparatus, N analyzer, centrifuge machine, Air conditioner, B.O. D. Incubator, single tier rotary shaker, recurring materials, Chemicals, Glass wares etc items for laboratory were purchased and the laboratory was kept well equipped for Under Graduate and Post graduate teaching activity . This department has prepared a course for experiential learning to UG students for 0 + 20 = 20 credits entitled, “Soil and Water Clinic”. This module is started from the academic year 2010-11. Total 27 students registered for this module.